MACON, GA. (March 7, 2017) – Today Rebuilding Macon marks an exciting new partnership with YKK AP America Inc. (YKK AP), naming them a Neighborhood Building Sponsor. YKK AP will donate energy-efficient replacement windows to meet the annual needs of the organization, aiding in its mission to preserve Macon neighborhoods by providing free rehab services to those in need. 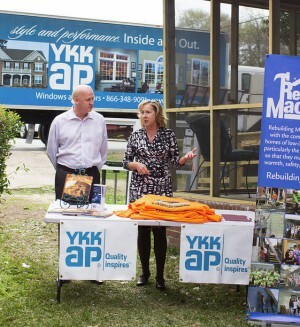 As a provider of residential windows made in Macon, YKK AP’s role as the official window supplier makes it a natural fit for this partnership. 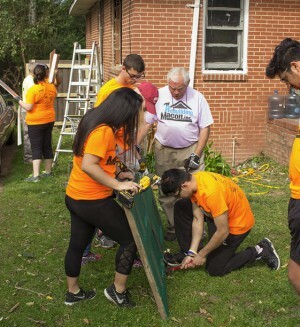 This week students from Boston University are volunteering with Rebuilding Macon and will install new windows provided by YKK AP as one of the many repair services they will perform for low-income homeowners. YKK AP will also provide employee volunteers for Rebuilding Macon’s 25th Annual Macon Rebuilding Day. “It’s no secret that in the neighborhoods we service, many are in need of new windows. This partnership is going to provide more opportunities to ensure that the low-income, elderly and disabled homeowners in those areas are warm, safe and dry. We hope this partnership will encourage more corporations and businesses to get involved in our mission,” explained Debra Rollins, executive director of Rebuilding Macon. In partnership with the community, Rebuilding Macon provides home repairs to low-income homeowners, particularly the elderly and disabled, so that they may live in warmth, safety and independence. Rebuilding Macon, Inc., is Central Georgia’s only non-profit organization working to preserve homeownership and neighborhoods by providing rehabilitation services free of charge to those in need. For more information, visit rebuildingmacon.org.